The months have passed and you realize that you still have several days of vacation that you have not been able to use. You have decided, no more getaways of three or four days, it will be a whole week. But where? You have seen several options, and remember that your friend José (that Jose we all have in our lives) told you that he had visited Stockholm during the weekend and that he returned in love with the city. Then you ask yourself: what can I do for a whole week there? Well, if you take a look in our blog you will surely find many options that perfectly fit your interests: activities, museums, and of course our Free Tours Stockholm in ENGLISH. But, if you are still worried that many days are in one place, or you just want to know a little bit more about the surroundings, let me tell you about Sigtuna. Located about 50 km northwest of Stockholm, Sigtuna is an easy place to reach, for example, from the Central Station, using the Stockholm Public Transport. To do this, take the suburban train (Pendeltåg 41) to Märsta and from there, take bus number 570 or 575 that say Sigtuna on its signs. It will take you about one hour to get there, so if you do not have the 3 or 7 day unlimited ticket, with a simple ticket (Ticket that enables you to use and combine all public transportation for 75 minutes) you can get there without problems, and you will only need more for the return. My recommendation is that you download the application from SL (the public transport company to your mobile) as soon as you arrive in Stockholm (or even before), because it will help you move around the city, showing you the schedules and all possible combinations. Even if you have not seen it yet, take a look at our first post where we explain the different ways to get to the city from Stockholm airports. Sigtuna is one of the oldest cities in Sweden, and still retains the feeling in some of its buildings and ruins. Founded around the year 980 by King Erik the Victorious (Erik Segersäll) the city flourished as a commercial place, trying to take the place as the leading city around Lake Mälaren, that until the beginning of the 10th century was the city of Birka, (I’ll talk about it in another post). Although the city was reconstructed and maintained a certain importance after the attacks that took place during 1187, it lost its role as the main economic center as other towns such as Uppsala and Stockholm began to gain importance. 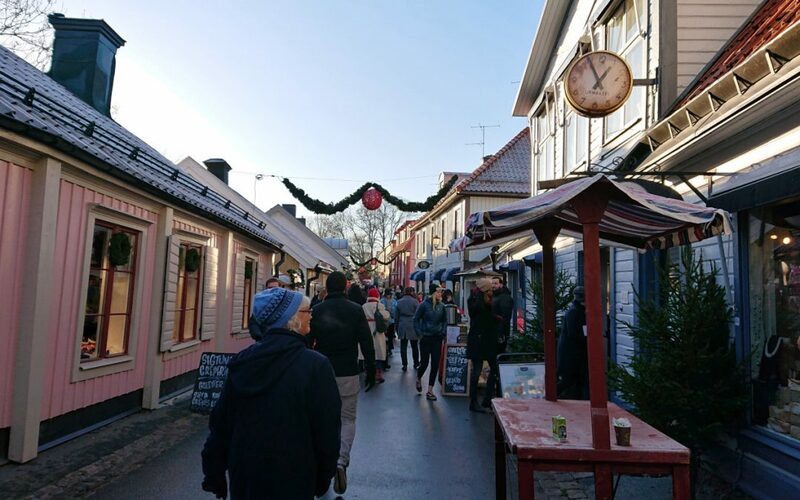 Nowadays, Sigtuna has around 10,000 inhabitants, and it has become one of the most visited places by tourists who come to the Swedish capital, not only for its history, but also for the colorful streets. Stora Gatan is the main one, and also the oldest street in Sweden, although its pituresque wooden houses are not the original ones, as this one, like many cities of the country, has suffered the inclemencies of fire. At the end of Stora Gatan is the old City Hall. It was built in 1744 and although it no longer fulfills the purpose for which it was built, weddings are still held there. Also, if you are lucky enough to visit the city in December, remember that every Sunday you will find the Christmas market mounted in the small square. The ruins of the churches of San Lorenzo (or S: t Lars), of San Olaf (or S: t Olofs) and of Santa María (or Mariakyrkan) are behind the City Hall and are testimony that Sigtuna was founded to be the First Christian city in Sweden, the home of the kings and center of the new religion. A place that is worth going to see. Beyond this, if you pay attention, you may find some of the 150 rune stones discovered in the area, which were carved during the Viking era. These stones honored the deceased, either those who had not returned from their expeditions as those who deserved to be remembered for their peaceful actions. The type of writing was born in the third century inspired by the Latin alphabet, and in the beginning was composed of 23 characters, but during the Viking era has been simplified to 16 runes. If you have an opportunity, visit the Tourist Office, where you will find a map with the location of some of them. Did I convince you? Come on! Go ahead, visit the city and leave us your comments, or share your photos in instagram with the hashtag #instafreestockholmtour.